In traditional Bengali household (in India’s West Bengal), Durga Puja is celebrated for ten days and the main portion of the Puja is restricted to 5 days only. The day of the new moon, i.e. the day before Debi Paksha starts, is known as Mahalaya. Traditionally, the artisans draw the eyes of the Durga Idols on this day and this process is called Chakshu Daan. The Main Puja starts on Shashti (sixth day of the Debi Paksha), generally from beneath a Bel (Bengal quince) tree. In the early hours of Saptami (seventh day), the Pran (or life) of the Goddess is symbolically brought from a nearby pond or water body, wrapped in a Banana Tree and then reinstated on the Ghat (Urn) and then to the Idol during the religious ritual, as per Indian scriptures. The banana tree is wrapped in a new red and white saree and resembles a newly-wed bride sitting in a Palanquin, going for her Wedding Bath. This banana tree is called Kola Bou (or Banana Bride) and continues to stay during the entire period of worship. The process of virtually implanting life into the Ghat and then into the Image is known as Bodhan. The Main puja or worship starts thereafter and the Primetime is reached during the transition phase or Sandhikshan between Ashtami (eighth day) and Navami (ninth day). Special Puja known as Sandhipuja is offered during this period. Arati or prayer with lights takes place every day starting from Saptami till Navami. Finally on Dashami (i.e. tenth day of Devi Paksha), the puja ends and the idol undergoes Bisarjan or immersion in a water body. This also marks the departure of Goddess Durga along with Her four children to Her husband's heavenly abode in Kailash. So, traditionally married Bengali women bid her farewell in a small ceremony known as Sindur Khela where they exchange Vermillon (Sindur) marks on each other's foreheads and also on the forehead of Goddess Durga along with symbolically feeding Her sweets, to remind Her of the hospitality. Sweets are also exchanged among Bengalis along with Kolakuli or mutual hugging and this ritual is known as Bijoya. Bijoya ensures friendship among individuals who then collectively vow to spend the year ahead in Peace and Harmony and to ward off any evil or hardship that may come up as hurdles in their lives.. The social aspect, which also stems from Indian mythology, goes like this that Uma, one of the many incarnations of Goddess Durga (Divine Mother), was the daughter of Daksha and Menoka, the king and queen of the Himalayas. She worshipped God Shiva as her future husband. Shiva, pleased by her penance, came from his abode in Kailash and married her. Her father King Daksha did not accept this marriage due to the beggarly, ash-smearing image of God Shiva but gave in to the perseverance of his daughter Uma. King Daksha then organised a special Yagna (worship of Agni, the Lord of Fire), where he intentionally did not invite his son-in-law Shiva to insult him. Uma, oblivious of his father’s intent, visited the Yagna, only to be humiliated and insulted by her father in front of all other invited guests. Under these unbearable circumstances, Uma jumped into the fire and died. Shiva was extremely enraged when he heard about Uma's death and sent his army of ghosts to King Daksha’s place to destroy him. Shiva’s army created havoc and decapitated King Daksha. On the request of the two other members of the divine Trinity – Brahma and Vishnu, Shiva came and absolved Daksha and gave his life back. Once resurrected, Daksha was extremely repentant about his act, asked for Shiva’s forgiveness and became an ardent devotee of Shiva. Shiva then gave a boon to the dejected Daksha that Uma will be reborn in his family. After that he lifted Uma's body over his shoulders and started to roam aimlessly on earth losing complete interest in earthly matters. Seeing Shiva engulfed in grief, God Vishnu threw His weapon Sudarshan Chakra to cut Uma's body into pieces which then fell scattered across India. The places, where these pieces fell, were known as Shakti Piths (or Places of energy) and different incarnations of Goddess Durga are worshipped in these places. Subsequently, Parvati was born to King Daksha and was married off to Lord Shiva. She then accompanied Lord Shiva to His heavenly abode in Kailash. Like any other loving and caring daughter, She visits Her parents' home every year, along with her four children Ganesha, Saraswati, Lakshmi and Kartikeya, who represent Wisdom, Knowledge, Prosperity and Beauty. Since this much awaited visit by the full family to Earth takes place once a year, this event is associated with so much festivity and celebrations to mark Her home coming. The image of Goddess Durga, which is worshipped during Durgotsav, depicts Her equipped with lethal weapons in Her ten hands, sitting astride a lion, which is Her carrier, killing the Buffalo Demon, Mahishashura. This Image of Goddess Durga along with Her four children on either side, reminds us of the "Inner Strength" that is required to emerge victorious from the eternal battle between "Good" and "Evil". As per ancient Indian scriptures, the demon king Mahishashura was immensely powerful and was torturing Gods and humans alike. During these difficult times, the ultimate Trinity of Gods – Brahma, Vishnu and Maheshwara (Shiva), merged Their divine powers along with the other Gods and created Goddess Durga to confront Mahishashura. Goddess Durga then went on to fight an epic battle with the demon king and his army and finally defeated them restoring peace and sanity to both Gods and humans. This defeat of Mahishashura by Goddess Durga is epitomised as a triumph of good over evil. As a result, Goddess Durga is worshipped by humans in this form of Hers where they pray to Her for their well-being, enlightenment towards wisdom, everlasting peace and happiness for mankind. According to Markandeya Purana, a King of the Chedi dynasty, Suratha, started the rituals of Durga Puja in 300 B.C. Archeological evidence from Parashurameshvara Temple built in 6th Century in Bhubaneswar, Odisha says Sadabhula Mahisamardhini Durga being worshiped in Shiva temples. The Durga puja has been celebrated since the medieval period, and has evolved and been adapted to the world as time passed. A considerable literature exists around Durga in the Bengali language and its early forms, including avnirnaya (11th century), Durgabhaktitarangini by Vidyapati (a famous Maithili poet of the 14th century), but the goddess Durga was not fully integrated into the Hindu pantheon, primarily in Bengal, in the 16th century. Early forms of Durgotsavs (Durga festivals) were primarily private worship in personal residences with the use of musical instruments such as the mridanga, mandira, and smakhya. During the 18th century, the worship of Durga became popular among the land aristocrats of Bengal, the Zamindars. Prominent Pujas were conducted by the zamindars and jagirdars, being enriched by emerging British rule, including Raja Nabakrishna Deb, of Shobhabajar, who initiated an elaborate Puja at his residence. These celebrations brought the Durgostavs out of individual homes and into the public sphere. Festivities were celebrated as a community, where royalty and peasantry were welcomed into the home of the zamindar or bania (merchant) to feast together. The festivities became heavily centred on entertainment — music and dance — as well as lavish feasts that continued for the entire month. In the 19th century, the Pujas celebrated placed less emphasis on elaborate celebration and feasting, and more on including all of the community. They moved from being a show of wealth and authority by royalty and merchants back to a festival of worship and community. Many of these old pujas exist today. The oldest such Puja to be conducted at the same venue is in Rameswarpur, Odisha, where it has been continued since the last four centuries, starting from the time when the Ghosh Mahashays from Kotarang migrated there as a part of Todarmal's contingent during Akbar's rule. Parking: Some parking places at the Venue will be marked for Swisspuja visitors. If these are already occupied please park at the Schwerzi-wildpark (parking free after 1900 hrs). 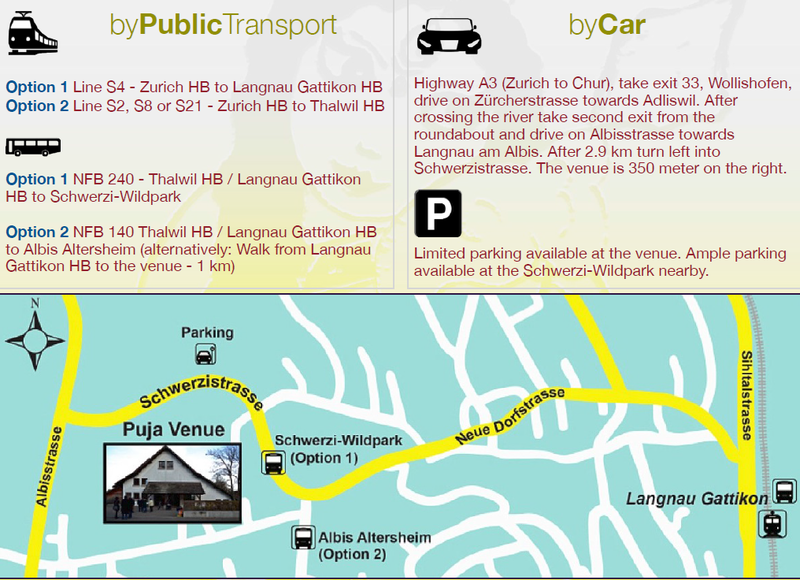 Please do not occupy the common parking places at the Venue (may get fined upto CHF 200). Note that the exit from the parking at venue is accident prone. Please be careful while driving out.